Quality learning is a right for all, not a privilege for a few. Since 2000, we have developed educators to make good on our promise to all students. With over 250,000 educators impacted, Insight is your partner for bringing large-scale change and greater success to your classrooms. We are an international educational consulting organization that partners with education leaders to develop the strategy and confidence to lead bold and equitable change—and we provide the wrap-around and embedded supports to make change happen. 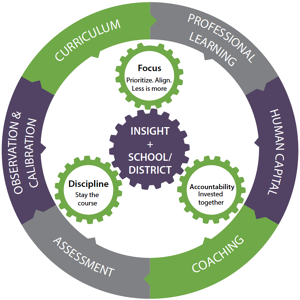 As former teachers, coaches, school leaders, and high-level district and state administrators, we appreciate the challenges, nuances, and opportunities of implementing large-scale change and we know the keys to making them stick. helping to change the culture of teacher growth to one of trust through PLCs, professional development, and instructional coaching. We have also been featured in numerous prominent publications. Since 2017, through the US Department of Education’s Teacher and School Leader Incentive Program (TSL), Insight is leading Empowering Educators to Excel (E3). “Insight has been a trusted partner for many years. We're a team of experienced educators with a passion for supporting teachers and school leaders in creating bold change in education. Since 2000, schools, districts, and states have seen significant impact from our work together. We're hiring experienced educators and other professionals to join our team. Browse articles, eBooks, and more on school leadership, coaching, supporting teachers, and other key educator effectiveness topics. Interested in learning more about how Insight can support your goals?